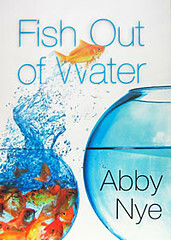 Abby Nye wrote Fish Out of Water and published it through New Leaf Press in 2005 and chronicled her freshman year adapting to the ‘liberal’ atmosphere of a secular university — this coming from a conservative Christian background. In hindsight, I should have read this a few years ago and been a bit more focused on what goes on at secular universities since my daughter went to Kent State University — she received an outstanding education I might add. Perhaps I’m reading this book a bit late … or perhaps not, since my son will be heading off to college next year? Nevertheless, I enthusiastically recommend Fish Out of Water and suggest that it is an excellent book for those wanting a first hand account of “what’s going on” in many American Universities; Abby Nye’s insight is especially helpful if one is coming from a conservative home. The advice for students wanting to know what to expect when choosing a ‘liberal’ university should be very helpful and her story will give students a leg up as they arrive on campus. (she also offers a few ‘survival’ hints) I’ll include a clip from an Amazon member review below.